Mount Desert Island is located in Maine, just a very short bridge ride into the ocean from the coast. It is the home to most — but not all — of Acadia National Park. Acadia is the second most popular park in the country. It is surely out of the way. It is surely worth the trip. What do you do there? You hike, whale watch, and eat. There is small town, Bar Harbor, and little villages where you can find lobster and pies and even lobster pie. 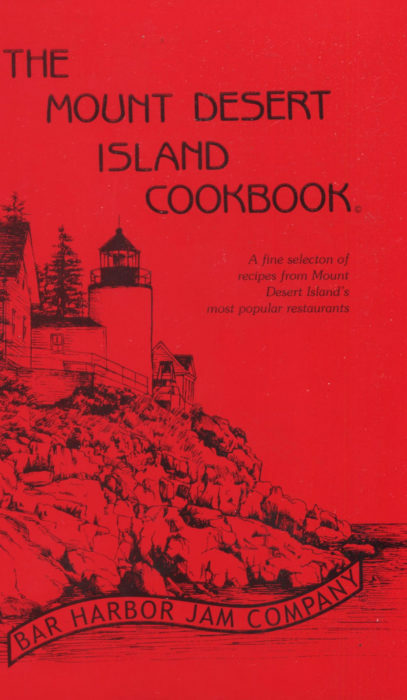 In 1984, the Bar Harbor Jam Company first produced this little spiral-bound book of recipes from the most popular island restaurants. There have been two updates, the last in 2006, so you’ll find old and new establishments presented here. All the closed restaurants are still here on the pages, their happy recipes preserved for your happiness. This is a slim gem. The recipes are brief, not complicated, and surely designed for the home cook. You can do them all, and well you might. It’s a wonderful guide to the restaurants now lining the byways of the island. And, if you want to experience classic Maine cuisine, the ideas are here for you to sample and savor.